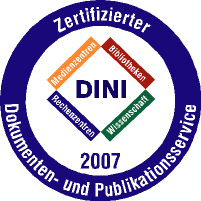 DuEPublico is the institutional repository of the University of Duisburg-Essen. Currently, the old and new version of our repository are running in parallel. On the new server DuEPublico 2 you will find all electronic thesis and dissertations, as well as selected Open Access publications including full text. On this server, you will find all OA works published so far, and also various learning and teaching material. Duisburg Essen University offers its doctoral candidates the possibility to disseminate their dissertations in full text form on the Internet via DuEPublico. DuEPublico offers the possibility to archive online publications in full text form and to make them freely accessible worldwide in the spirit of Open Access. DuEPublico is operated by the Duisburg-Essen University Library (UB) in collaboration with the Centre of Information and Media Services (CIM) .